Located just south of Charlottesville in Virginia's Piedmont, Monticello was the primary home of Thomas Jefferson, who began designing after inheriting the land on Carter's Mountain at the age of 26. It is ironic that Mount Vernon, George Washington's Classical estate on the Potomac, has become so widespread a model for American building, for it was not Washington but Thomas Jefferson who self-consciously undertook a search for an architectural expression for the new nation. In 1767, at the age of twenty-four, Jefferson set out to put his studies into practice, designing a house to be built on a hilltop across the Rivanna River from his father's plantation, looking westward to the Indian country beyond the Piedmont. The decision to build on a hilltop site, despite numerous practical problems including a shortage of water, reflected Jefferson's soaring imagination and belief in the nearly limitless possibilities inherent in the vast continental expanse. "Monticello" translates as "little mountain", but the home is situated near the top of 1,800-foot Carter's Mountain. The name Jefferson chose for his new plantation — Monticello — and to some extent its siting, paid homage to Palladio, who recommended that a house be built in an "elevated and cheerful" place (a choice he deemed second only to a site along a river). "Monticello" translates as "little mountain"; but where Palladio would have applied the term to hillocks such as those along the Venetian coastline, Jefferson used it to describe a looming eight-hundred-foot promontory that was, despite its height, merely a foothill to the mountains that lay beyond. In the New World, even Arcadia was superscaled. Jefferson cropped and terraced the hill, planting gardens and orchards that contrasted with the surrounding forest to create a village for his "family," which by 1774 included twenty-nine slaves assigned to the house. 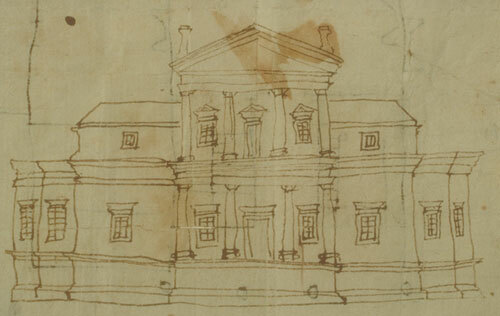 Jefferson drew his first known drawing of Monticello in 1769-1770. The design and its siting paid homage to the Italian architect Palladio. Jefferson would continue to work on the home for the rest of his life. Ink on paper. Courtesy of Thomas Jefferson Foundation. and aesthetic reasons. When he returned to America in 1789, Jefferson saw the half-finished edifice and reacted with optimism: "Whenever it shall be finished with the proper ornaments belonging to it (which shall not be in this age); it will be worthy of being exhibited alongside the most celebrated remains of antiquity." The exigent building, finished in 1797, never acquired the ornaments Jefferson desired, but it was nonetheless the purest contemporary example of Classical architecture in the world. By the very authority of its antique associations and the monumental dignity of its design, Jefferson had succeeded in giving the new republic its first identifiable architectural form: not a provincial version of a royal palace but a pure replication of a temple, which elevated statecraft to the symbolic status of religion. As Fiske Kimball has written, "The columns were used not only as elements of intrinsic magnificence, but as trophies of the Classical culture of the builders. The portico was to be a frontispiece to all Virginia."" crude production, before the maker knew his trade, or had made up his mind as to what he wanted." Jefferson's Paris sojourn, though motivated by affairs of state, opened his eyes wide to the breadth of European culture and introduced him to the most sophisticated architecture of his day, exemplified by the writings and designs of his confidant Clérisseau, as well as the work of the revolutionaries of French Classicism, Claude-Nicolas Ledoux and Étienne-Louis Boullee. Europe stimulated him to rebuild Monticello as an American symbol; in so doing, he transformed an elegant country house into an architectural epiphany. Whereas the first Monticello was the work of a devoted student of Palladio, the second version would be that of a colleague across time. Jefferson's direct exposure to Roman architecture made him aware for the first time of the degree to which it had inspired Palladio. From that point on, William Pierson has written, "Palladio shifted from his role of teacher to that of fellow Romanist."" While Jefferson relied in part on his brief encounters with the work of French architects and with the remains of ancient Classical monuments, the facts of geography confined most of his architectural investigations to the pages of books. It is therefore not surprising that he became a rather eclectic designer, who incorporated conventional elements in a synthesis that was frequently inspired if not entirely resolved. In this sense his was the paradigm for American architecture. For it is not in the specific elements of Jefferson's Monticello, or of his equally compelling University of Virginia campus, that we look for originality; rather, Jefferson's genius is to be found in the way those elements were put together. From the first, American architects would not invent a new language; but they would struggle to say new things. Jefferson's reconfiguration of Monticello took the form of a Classical temple surmounted by a noble if somewhat incongruous dome, from which two long parallel wings, tucked into the hillside, project to embrace a U-shaped courtyard. He covered the wings with nearly flat roofs so that, at first glance, they seem little more than terraced walkways leading to isolated gazebo-like dependencies that appear to punctuate a great lawn. The design offers commanding views of the distant landscape, which for Jefferson was a continental garden unparalleled in its beauty and promise. Like Palladio's Villa Barbaro, Monticello's Classical design is rendered in the local argot. Palladio used red tile roofs and stucco walls; Jefferson covered his roofs in tin and built his walls of red brick trimmed in white-painted wood. Jefferson's artistic daring, and his amateurism, were most vividly manifested in his placement of the low Roman dome atop the pedimented Doric portico that forms the entrance — in effect making the house-temple into a church as well. (Both the Pantheon in Rome and Palladio's chapel at the Villa Barbaro used a similar device.) The dome is not part of a grand, lofty space in the house but merely shelters what Jefferson called his "sky room," a largely inaccessible space raised from mundane status as an attic to a magnificently purposeless place of meeting, far beyond the ordinary ambitions of a wilderness house. The construction of the crowning dome proved that the grand ideas of Classicism could be realized by the rude carpentry of the frontier. However, the overscaled detailing that Jefferson used to articulate his design — based in part on the ancient Temple of Vesta, with a baselike wainscoting large enough to support columns four times as high as the room itself — suggests that his ideas were sometimes too big for their reality. As Jaquelin Robertson has observed, Jefferson's giantism of scale and detail seems to be his way of saying that "out here in the wilderness, I must exaggerate Classical reference or no one will hear me." For forty years, Monticello's peaceful hilltop resounded with the blows of construction hammers, evidence of a restless mind that took as much pleasure in the process as the product. As Jefferson reportedly said to a visitor in 1809, "Architecture is my chief delight, and putting up and pulling down one of my favorite amusements." To unravel Monticello's complexities is not only to fathom Jefferson's dialogue between ideal reason and empirical fact but also to understand the unresolved psychological complexities of its architect. Though a monument to the agrarian republic of Jefferson's imagination and to the family farmers he considered the moral concomitant of democracy, Monticello was also a temple dedicated to its architect — a self-portrait in bricks and mortar. For all its aspirations to the magisterial resolution of national culture, Monticello, like the best American houses that followed it, celebrates the eccentricities of its strong-willed owner's personality. It reveals the obsessive nature of its builder as he relentlessly invented and reinvented himself and his environment at the edge of civilization.